What case can be made for considering whether [ə] and [ʌ] are different phonemes or not in American English? Please note the focus is on standard American English. EDIT: i.e. : on General American. However, if these truly constitute two different phonemes, then we should be able to come up with minimal pairs to illustrate the contrast between both sounds. I cannot think of a single minimal pair to contrast /ə/ and /ʌ/. It's interesting to look at CMU Dictionary, the pronouncing dictionary of American English. My understanding is that, provided the stressed syllables are pronounced longer and with more energy, saying BACKUP, KETCHUP and CUSTOM as [ˈbækˌəp], [ˈkətʃ.əp] and [ˈkəs·təm] would not hinder comprehension in the least. As I see it, there's only one phoneme here, which happens to be realized [ʌ] in stressed position and as a schwa [ə] in unstressed positions. Problem 1 : if /ə/ and /ʌ/ are different phonemes, what are some examples of minimal pairs between the two? Problem 2 : if they are allophones, which notation should be used for the phoneme? I assume /ə/. The reason I'm asking is because I'm teaching American English with a lot of phonemic transcriptions – why teach two phonemes when there's only one. Finally, where would professional linguists locate those sounds on the following chart (again, from an American point of view)? The only discussion of the topic I found online so far is on this forum. There's also, to some extent, the Talk section about the ARPAbet article on Wikipedia. EDIT (DEC 2018): FYI, I was asking the question in the context of designing an IPA chart for American English (General American), to teach phonetics and ESL, which implies deciding just which phones to teach -- and why. This is a well-written argument, but I think it's mistaken to conclude that they are the same phoneme; or, more to the point, I think this is a case that highlights a limit of phoneme/allophone analysis. Indeed, the same argument can also be used to show that /ə/ and /ʊ/ are allophones of the same phoneme: there cannot be a minimal pair because of the restriction of the stress patterns on the syllables they occur in. But then there is a problem, since there are plenty of minimal pairs distinguishing /ʌ/ and /ʊ/ (e.g. put/putt). [ə] and [ʌ] are allophones of a single phoneme. Schwa appears in an unstressed syllable and wedge appears in a stressed syllable. Because of this complementarity, it is not possible to find minimal pairs distinguishing the vowel. However, the analysis has to be performed on phonetic transcriptions and not an assumed phonemic reduction of the phonetics, thus the pair [ˌsʌbˈvɹ̩ʒn̩] (sub-version) and [səbˈvɹ̩ʒn̩] (subversion) is not a minimal pair, because the initial syllables differ in stress. An alternative would be to claim that stress is phonetically predictable, but is sensitive to whether or not the vowel in question is schwa (schwa cannot be stressed). Minimal pairs like the noun / verb contrast "pervert" [ˈpɹ̩vɹ̩t] / [pɹ̩ˈvɹ̩t] establish that stress is not phonetically predictable in English (a point that is well-known). The logic of phonemic analysis alone does not dictate that schwa and wedge must be reduced to a single phoneme, it says that they may. This is a classic problem of phonemic analysis discussed in the classic paper "The non-uniqueness of phonemic solutions of phonetic systems" by Y.R. Chao. If you add to the theory an Occam's Razor compulsion to minimize the size of the phonemic inventory (which was also done), then you must reduce these two phones to one phoneme. 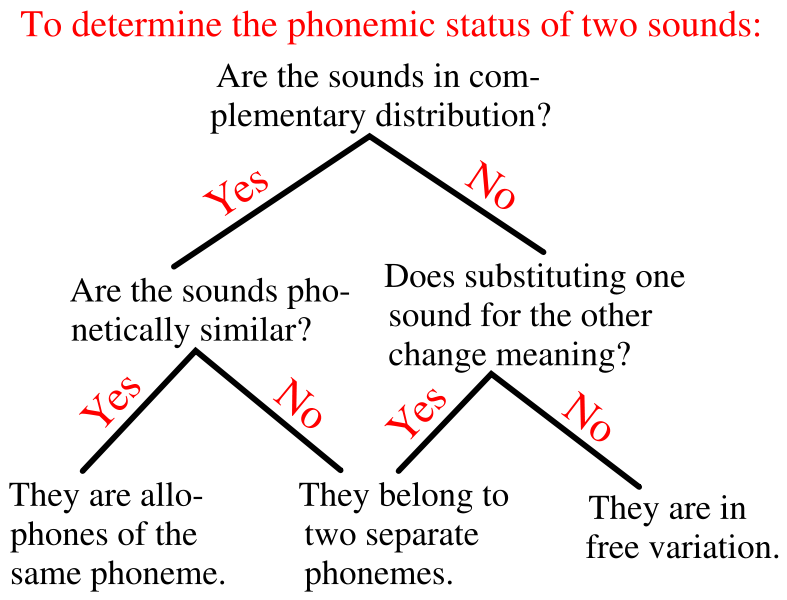 Since in phonemic analysis, phonemes are classifications of diverse sets of phones, it is a category error to think that phonemes have phonetic properties. It is however reasonable to wonder what would be a convenient way to write that phoneme: I personally like schwa, but there is nothing wrong with wedge as a letter. More languages use schwa as an official letter that use wedge, if that matters. Your logic chart does replicate the flow of thought used in popular accounts of the concept phoneme. Phoneme choice does not "change meaning" (if you think about what "change" means, that should be clear), and failure to "change meaning" does not mean that the sounds are in free variation. The minimal pair test is an absolute test for phonemic status: if [a] and [b] appear in the same phonetic substitution frame ([bɪp] "horse" vs [bɪb] "arrow") then the sounds are instantly proven to be distinct phonemes. If there are no such pairs, it is still possible that they can be reduced to a single underlying phoneme. The crucial question is whether some set of rules can be posited to derive the phonetic outputs: if not, then the two sounds cannot be distinguished purely by rule, and there must be two phonemes. Free variation, on the other hand, refers to the situation where the same word can be pronounced in two different ways, and there is no linguistic distinction between the pronunciations (one may find social distinctions, such as whether the pronunciation [ð] is in a more informal register compared to [d] (in Palauan). The key is that free variation is defined in terms of "same word", not "changing meaning". Different words, of course, often have different meanings, but not always (sofa, couch). For a minimal pair to contrast /ə/ and /ʌ/, how about: "subversion" meaning an act of subverting, and "subversion" as in version 1 subversion 1.2. Your question doesn't really have an answer. For me, there is a contrast between the weak form of just meaning recently, /dʒəst/, and the word just meaning fair, /dʒʌst/. I use the weak form of just almost all the time, and the vowel is definitely different from the one I use in just, meaning fair. So I perceive them as different phonemes. But many Americans pronounce them exactly the same, and these Americans would probably perceive them as the same phoneme. Stress is phonemic in English, so of course [ə] and [ʌ] are different phonemes, since only the latter is stressed. 'Bacup' (a town in Lancashire) /beikəp/ and 'Bake up' /beik ʌp/, however the stress issue may still apply. In addition to that I would call the articulation of /ʌ/ the most similar to /ə/ from all English phonemes. To me, the schwa is similar to the Turkish dotless i. A vowel close to no real differentiation, and with that imo a shorter and less pronounced version of ir as in birth. Once a vowel is pronounced in a very 'flat' way and it gets short (as when there is less stress on it), we get the schwa - with the above mentioned exception /ɪ/. The word custom is actually a good way to show the difference. If we replace the schwa with an /ʌ/, we get something like custum (let's put stress on both syllables for clarity, but with a little bit of trying, one should be able to just stress the first syllable and still get the u-sound, not the schwa, in the unstressed syllable). The u in backup is also a good example. If we pronounce it the same as back up (trying to stress both words, for clarity again), we should hear a difference to the American way of saying backup (trying to stress the up but keep the pronunciation 'flat'). In both words, we can try to stretch out the schwa or the /ʌ/, and we will hear a sound similar to ir in birth and a in car, respectively. American English tends to 'flatten' the different vowels, so a lot of vowels could probably be replaced with the schwa. I'd leave it in the current way in IPA, because a lot of people do actually have a hint of the vowel in the pronunciation, with the phoneme chosen according to the usual rules or regional variation. Where it's rare to pronounce the vowel clearly, one might also choose the second most popular pronunciation in the region or in important dialects (British and American English, in the future probably also Indian English), with some indicator that people often 'flatten' it to a schwa. One might also consider that pronunciation is often not only affected by the spelling of a word, but also the way dictionaries say they are supposed to pronounce it. Putting a schwa everywhere would probably not help people pronounce things so that an English speaker from another country can understand them. While having a 'real' vowel there would give people a 'standard pronunciation' for when trying to talk especially clear, for instance to a foreigner. Not the answer you're looking for? Browse other questions tagged phonology phonemes american-english allophones or ask your own question.